This course helps leaders analyse their leadership abilities and target strengths and developmental areas in order to help them become better, more effective leaders. Leaders develop measurable, attainable goals that stretch their capabilities and accelerate development through diagnostic tools and processes, and developmental planning tools and resources. This module will help leaders power-up their skills to better meet their team members’ needs and create better organisational results through people. Leaders learn to tailor their approach based on each individual team member’s motivations and personality tendencies, the organisational environment, and the situation. This training helps you make sure that your point of view is heard and that your needs and wants are met without violating others’ rights. If you manage others, communicating assertively allows you to give instructions clearly while maintaining the respect of team members and harmony within your group. This provides leaders with the skills to develop strong relationships and communicate with team members effectively. It also provides tips and techniques for improving your listening skills, describes the role that body language plays in communication, and covers how to use it effectively to build rapport with your team members, colleagues and managers. This is a 5 module programme that teaches the basics of management to frontline supervisors. Reinforcing the Positive sharpens supervisors’ skills in communicating positive results to motivate employees. Motivating with Constructive Feedback is about closing the gap between performance expectations and actual performance in a positive way. Handling Difficult Performance covers taking corrective action without incurring negative consequences. Coaching for Results provides tools for encouraging employees to take more responsibility and solve problems for themselves. This course is designed for managers so that they can support the coaching their supervisors do on a regular basis. It is a complement class to our CLIMB series. The focus here is to help managers foster the supervisors’ ability to gain commitment, build accountability, and ultimately effect a change in the behaviour of the person being coached. 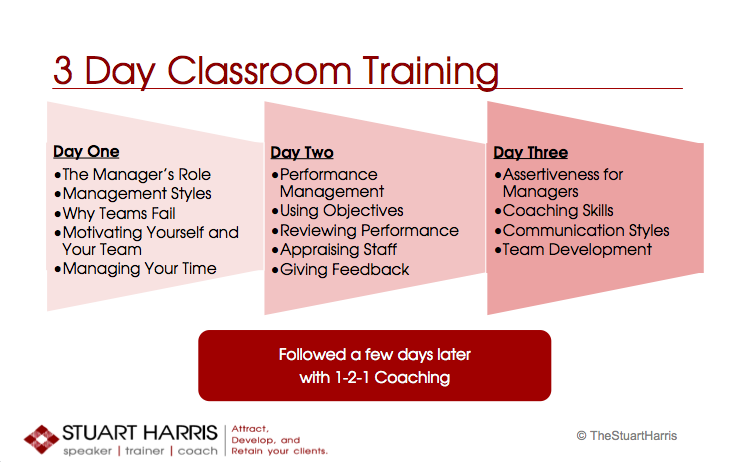 We highlight the communication skills of a successful coach, and listen to how others coach and evaluate through the use of our CLIMB coaching model and strategies. This module is designed to assist managers conducting assessments with their direct reports. Strategies for providing constructive feedback and coming to consensus are provided. This course provides specific tips and techniques; for conducting side-by-side coaching that is both effective and positive. Conflict is inevitable in the workplace because people don’t always view things in exactly the same way. Your leadership success will in part depend on your ability to deal with conflict by being aware of possible sources of conflict and proficient in resolving it. This module is designed for those leaders who work directly with external clients. The first day of this two-day programme focuses on relationship building skills while the second day covers negotiating. The success of your meetings depends on your skill at managing the group process. Learn to have more productive and exciting meetings that stimulate active and enthusiastic participation. Effective Feedback is one of the keys to your success as a leader. How you provide that feedback will often spell the difference between success and failure for your team. This course is interactive and designed so that participants learn how to identify benefits of goal setting, develop appropriate goals, translate those goals into action, monitor goals, and revise goals as necessary. This is a course for operations supervisors providing strategies for handling those difficult complaints from irate or unhappy customers. Motivating and Gaining Commitment from employees is an important challenge for all leaders. You will be presented with three theories of motivation that will help you identify the different needs of your employees and develop an appropriate motivational strategy for each situation that you encounter. This course describes a successful performance appraisal process, how to schedule, prepare for the meeting, facilitate the meeting, and give effective feedback. This introduces you to a set of tools and processes that will allow you to make decisions and solve problems more effectively. This module that will help participants understand why change is vital to our success in business and life. Key concepts include knowing the importance of effectively communicating change by using strategies and practices that reduce resistance and develop commitment to the change. This course helps leaders set individual and team goals that meet the objectives of the organisation and result in higher levels of performance. You will learn how to set effective objectives that will motivate your employees and result in increased productivity and higher standards of customer service. Some stress factors can be controlled; others are unavoidable, but your attitude toward them can minimise their effect on you. In this class you will learn what stress is, how it affects us, and what you can do to lessen its impact on you and your work. This course provides strategies for developing the skills of the individual team members and the team as a whole.